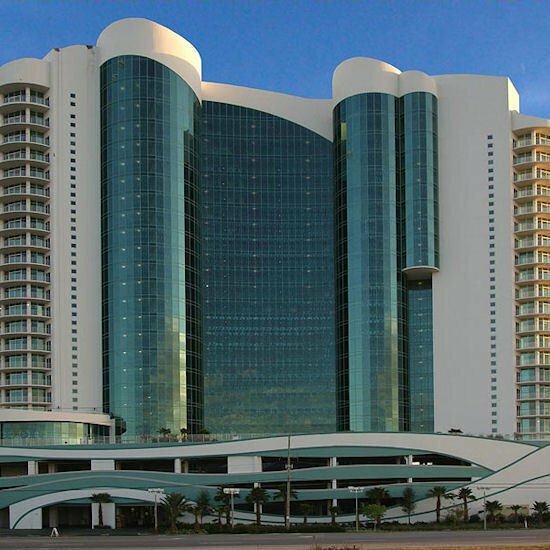 Check Rates & Availability at Turquoise Place - Orange Beach, AL! Establishing a new milestone for elegance of any property along the Alabama Gulf Coast. Turquoise Place rises to a majestic 370 feet with 400 luxurious condominiums housed within two towers each encased in shimmering turquoise glass. The 13.75 acres of property provides a solitary/relaxing/atmosphere in the beauty of the extending sugar white sand. Each unit ranging from approximately 2300 to 5900 square feet has a magnificent view of the turquoise blue waters of the Gulf of Mexico. Turquoise Place is truly taking expectations to the Next Level by providing Jacuzzi brand hot tubs and outdoor kitchens on each balcony. a high-definition digital television mounted above a gas fireplace and Wolf and Sub-Zero stainless steel appliances in the kitchen. Technology is a priority. The buildings have smart-key security each unit has wireless internet and more than 100 channels HD and movie channels. Turquoise Place amenities are nothing less than the best with top-of-the-line pools/lazy river/state-of-the-art fitness centers/covered parking/tennis courts/endless water activities. All of this and so much more Welcome to the Next Level. Dining on the Gulf. Kid friendly with playground. No refunds for cancellation. Property suggests purchasing travel insurance. No-show fee is full stay including tax. Exceptions may apply during holidays- special events or conventions.